Check out our new additions to the Gallery page. Several milestone projects stand out among the work recently produced by Holographics North. Here (at last) is an update on some of those jobs. Rochester, NY has for centuries supported the arts generously and creatively. The Memorial Art Gallery recently opened its 100th anniversary exhibition entitled "Memory Theatre 2013". We produced for them a very large image of their iconic statue "Memory". Being 12 feet tall of solid marble, it could not be relocated. The hologram installation is superb, commanding a spiritual room of its own, inviting you to stay a while, revisit your past, and contemplate your future. The University of Rochester asked us recently to produce a hologram of their monumental statue of Kodak founder George Eastman. We worked from the 18" sculptor's maquette, undeniably charming in its rougher finish. Near the bottom, Eastman's famous quote floats several feet out in front: "The progress of the world depends almost entirely on education." We were recently asked to loan a hologram for display in the enormous front window of the MIT Museum. 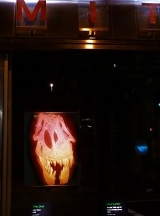 Our classic T-Rex Skull image was chosen, as an example of the true analog process, and one of the very best. No digital steps of any kind were involved in its production. The display was chosen as one of the "things to do" on Boston.com. Pixel Light Digital Media recently contacted us to produce four 3x4 foot holograms in blue for a pharmaceutical client. The animated images were to exhibit various neurological conditions. We teamed up with Pixel at Rollercoaster Studio in New Jersey to shoot the six actors involved, using our 5' turntable and a high-def RED camera. Text was overlaid digitally. 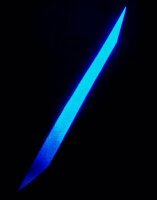 A 3 watt, Par-20 LED lamp illuminated each hologram, producing a brilliant, deep blue image. We are now in the late stages of our 5 year project for artist James Turrell. 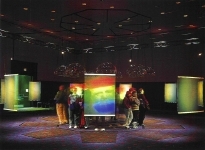 The work involved the production of 40 very large format holograms, up to 3x 6 feet in size. It has been a pleasure to work with someone so aware of the qualities of light, color and design. 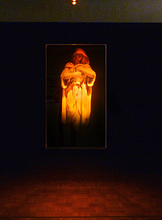 Paula Dawson is an old-timer in the world of holographic art. When asked to produce a tribute to Australian patron of the arts Ann Lewis, she designed a wild, computer animated, tour de force concept. 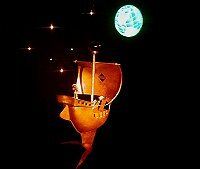 Bristling with references to Ann and her many interests, the hologram was one of the more difficult we have produced in the last few years. The first copy on display was in the window of the MIT museum. A statue was recently erected in Scotland to honor this 19th century physicist, famous for his work with electricity and magnetism, light and color. He is the author of the elegant and profound Maxwell's Equations. 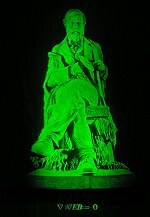 Simulaneously, HNI was contracted to produce a large hologram of the statue, to be displayed at Heriot-Watt University, as well as several other locations. We worked closely with holographer Michael Medora in London, as well as Andrew Walker at Heriot-Watt. Mirror mounted, framed and illuminated with green LED's, the piece is attracting an unusual degree of attention. It was an honor to be involved in this project. Helsinki artist Tulay Shakir needed a hologram to be installed as a floor tile in a school. His design is simple and effective. 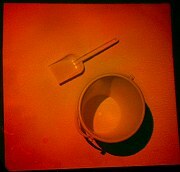 As you look down "through" the floor, you see a child's sand pail and shovel, as if hidden away under the building. How wonderful! Sadly, we report that our friend Harriet passed away in March, 2008. 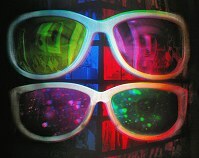 A remarkably perceptive vision has been lost. During that month, we were in the midst of producing perhaps our 20th portrait for Harriet, once again challenging the traditional boundaries of animation and human interactions. The rapid, often incoherent movement in this image speaks to the joy and trust within family frameworks. As with many holograms, you have to see this one to understand. At the bottom of this page, we continue to show the original work we produced for Harriet in 1999. Borkur Arnarson of Iceland asked us to produce a hologram for artist Hreinn Fridfinnsson. 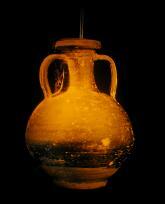 The image was to represent a 700 year old Roman Vase. Two vases were shipped to us, and both Borkur and Hreinn came for the shoot. The work went so well that both vases were used to produce 3 different holograms. 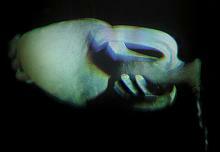 All three were made from open aperture masters, for possible achromatic illumination, as shown here in "...Hands". One of these is mirror-mounted and illuminated by amber LED, to be hung over a fireplace in London. The others have been shown in New York and Berlin. Our very own lab assistant Brooke Ray lent us her hands for "Vase and Hands." Following up on the work we produced 4 years ago for the Charles M. Schulz Museum in Santa Rosa, California, artist Michael Hayden of Thinking Lightly has now requested a new image for the holographic birdbath. 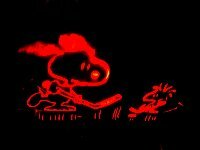 The birdbath shows Snoopy and Woodstock in various stages of hockey, their original cartoon figures rising directly up from the "icy" surface of the 38" birdbath. We hear rumors that this exhibit is the most popular one in the museum. Australian artist and teacher David Warren spent a few very enjoyable days with us, working on two holograms conceived around the social behavior of teenagers and adults in today's technoworld. 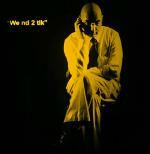 David is the subject in "TLK", and lab assistant Michael Heeney sat in for "dangerous". Both are illuminated with amber LED's. We recently worked again with holography veteran Paul Barefoot of Holophile, to produce a commemorative hologram for the National Security Agency. In Paul's own words "Visitors to the National Security Agency Operations Center (NSOC) at Fort Meade, MD are greeted by a 40" x 30" hologram depicting a C-121 aircraft, projected into space 20 inches in front of the holographic film. 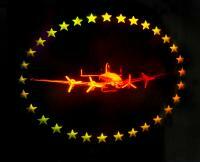 31 stars encircle the aircraft just aft of its wings. NSOC was formed from the need for a coordinated response to the downing of an American electronic surveillance aircraft by North Korea in 1969. The 31 stars symbolize the 31 American lives lost, whose names appear on an adjacent plaque." 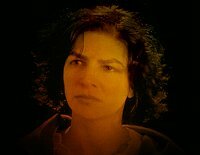 Another artist, Christine Remy of California, shot the turntable footage for three large portraits, based on the theme of grief. Animation is subtle, and expressions are probing in this powerful series. UPDATE: Christine has recently returned to expand her series with 3 new portraits. For the second time in 3 years, Holographics North has earned the Best of Year award from the International Hologram Manufacturers Association. Announced at the Holo-pack/Holo-print conference in Shenzhen, China, the award is shared with co-producers Holotouch and Atlantex, for development of the Beam 1 holographic user interface. HNI pioneered the concept and realization of the holographic component of the system. 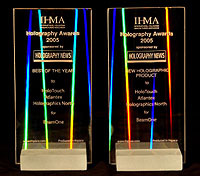 HNI also shared the 2005 Best New Holographic Product award, for the same R&D effort. HNI has been privileged to produce a very special hologram. We were approached last winter by Spatial Imaging and artist Chris Levine of London to create a very large holographic portrait of Her Majesty, Queen Elizabeth II. Two photographic sessions were granted with the queen at Buckingham Palace. Levine worked with Rob Munday and Jeffrey Robb of Spatial to shoot the 200 frame sequences required for our holographic process. These were then sent to us, and our staff produced the 85x120cm hologram. Prince Charles recently unveiled the first copy at The Jersey Museum in St. Helier. The piece, entitled Equanimity, was commissioned to celebrate the 800th anniversary of Jersey's allegiance to the crown. 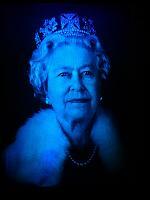 Illuminated with deep blue LED lights, the image is strikingly realistic, quite royal, and yet very warm in its effect. HNI's John Perry recently worked again with Levine to install a copy of the hologram in the Queen's Gallery at Buckingham Palace. It has also been shown at the Tower of London. Shown: Equanimity, 36"x48" (85x120cm); and John Perry of HNI (left) works with artist Levine on the Buckingham Palace installation. 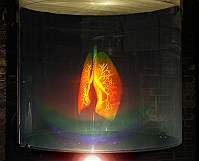 Lungs Pennsylvania based Ark Media designed a trade show display centered around a cylindrical hologram showing human lungs, inhaling and exhaling as the cylinder rotates. 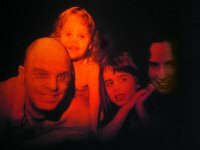 Working from computer graphics they provided, we produced the hologram in the largest cylindrical size every made. Physics Texts Two of America's largest publishing companies have recently used photos of HNI holograms in physics textbooks to illustrate the capabilities of the holographic medium. In each, left and right perspectives of the same hologram are shown side-by-side, indicating how the process of diffraction can project different images into different directions in space.This creates the continuous array of parallax necessary for 3-D vision. Critical Acclaim A large format project produced at Holographics North for Boston artists Harriet Casdin-Silver and Kevin Brown has won strong reviews from two of the world's most respected critics. 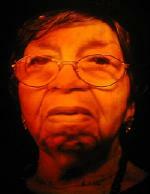 A Celebration of Aging, originally shown at Boston's 2000 First Night Celebration, is a collection of enormous holographic portraits of elderly Boston area people. Kevin Brown's sound domes are suspended above each hologram, from which the subjects tell their stories. A.D. Coleman says of the work "...the uncanny sense of presence that radiates from the holographic representations adds a haunting dimension of immediacy to these images... Only holography yields this effect. ... Interestingly, its technological uniqueness appears to not only entrance audiences but also allow them to engage with these controversial issues" (of gender, aging, and sexuality). Coleman goes on to recognize the timely and powerful impact of Casdin-Silver's concept. And Miles Unger, writing of this work in the July 15 Arts and Leisure section of the New York Times, finds that "Together, sound and image create an enormous sense of a vital, living presence, but one that is paradoxically tenuous."